The Noah Healing Hero Bear in PINK speaks with love and support for everyone who is heroically fighting BREAST cancer. Noah benShea is one of North America's most beloved and respected poet philosophers. Now his words of inspiration and hope can be heard in a heartwarming reading by the author himself. This 12" Golden brown shaggy bear’s mouth moves, while the Noah Bear REMINDS THE RECIPIENT THEY ARE NOT ALONE AND offers support to all who are with courage and grace fighting cancer AND CHEERING A CURE – SOON! Bear requires 3 AA batteries included. Let the calls of nature serenade you each time your raise your cup. 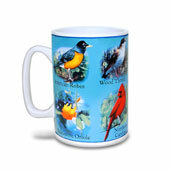 Our new mug plays one of twelve notable North American Song Birds each time you lift your cup. Makes a great gift for an avid bird lover or "just because" gift for mom. Ceramic mug holds 12 ounces and includes a Sound module that can be removes for easy cleanup. Bird mug requires 3 AG10 button cell batteries included. While it has only one button, this silver tone watch announces the time, day and date, year, and has a beeping Alarm. It is very simple to set and even easier to use. Best of all, this talking watch has a comfortable Velcro strap that's easy to put on and size. Features both Male and Female voices that announce the Time by pressing the button once. Pressing the button twice announces the Day, Date, and Year. The watch also features easy to read numbers with a red second hand and an alarm which can be easily set. The strap is a fashionable black on white with a Velcro strap that fits any size. Choose white or black strap each sold separately. She can't hardly wait to share her love with you! Give her hand a press and her head bobs while singing "Can't Hurry Love". Our plush tan bear holds a plush pink heart with XOXO appliqued on the front. Whitney measures 8" and requires 3 AAA batteries included. He's got plenty of love for you! Give Gary bear's hand a press and his head bobs while singing "Come And Get Your Love". This plush brown bear holds a plush strawberry ready for the dipping. Gary measures 8" and requires 3 AAA batteries included. This 12" hippo is hungry for your love as he sings and dances to the hit song "Hungry Eyes" from the iconic 80s film Dirty Dancing! Give his foot a press and his mouth moves and body sways as he sings. He wears his "Hungry for Love" apron, chef's hat and holds a heart shape spatula. Hugo requires 3 AA batteries included. Our cute Dark brown bear with red and white gingham bow and heart paw pads , holds a flower just for you. Give his hand a press and his mouth moves, head and body sway while singing, "Let Me Be Your Teddy Bear" In a cute child's voice.Great gift to give your sweetie this Valentine's Day. Teddy bear stands 11" tall and requires 3 AA batteries included. This plush white bear is just the right gift to give that special champion in your life. Give her paw a squeeze and she moves her head from side-to-side while singing "You're My Hero." She holds a flower with the words "You're My Hero" embroidered on the front. Hazel bear measures 12" and requires 3 AA batteries included. 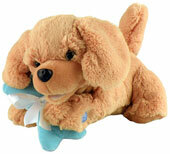 Delight mom or that special someone with our new adorable Buddy the Golden Retriever Puppy. Give his foot a press and his Head sways, mouth moves and tail wags while singing, "Count on Me." Make everyday a special day for her with this huggable pup! Buddy measures 2 feet long and requires 3 AA batteries included. This plush porker is cookin' up some goodies for you. Give his hand a press and our Hamlet Pig Dances side to side as he sings, "Hey Good Lookin'." He's dressed in his bar-b-que chef's hat and apron. Hamlet stands 12" tall and requires 3 AA batteries included. Give your sweetie this adorable giggling plush heart to express just how you feel. Give it a squeeze and it giggles just enough to bring a smile to his or her face. Set of two hearts come in red and blue. They measure 5" and batteries are included.